Discussion in 'iPad Apps' started by cat616, Jun 25, 2011. I have had my iPad2 for about 2 months and my iPhone4 for about a month. I am looking to make my job more mobile so that I am not stuck at my desk all the time. At this point I would find the iPad and iPhone more useful if they had a decent Calendar app so I will be looking for a solution to that. I hope to be able to provide some help to others along the way. Patients grasshopper... iOS5 is coming. Hello Cat616 - welcome to the forum! Just curious if you have explored the full potential of the built-in calendar app for the iPad2 - there are a lot of features most of which I do not use; usually setup my calendar in my Yahoo Mail account, then sync to the iPad via Wi-Fi - multiple calendars can be used easily and integrated; many other features and options are possible. Apple's iPad manual has basic information, and I assume that you've gone through that chapter by now? 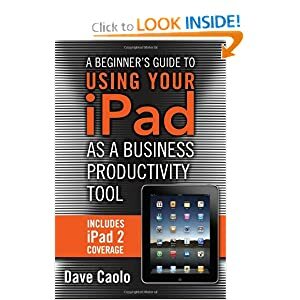 The book below (which was 'free' not long ago when I added it to my Kindle app - now about $5) has an excellent discussion of the 'Calendar' - should serve most everyone's needs. Post your issues and why you feel the current app has limitations for your purposes - maybe others can advise - good luck! Have a look at "Week Calendar HD". The format is almost identical to the standard app and it syncs the same way with Outlook etc, but you can also change colors, font sizes and other settings. If you are looking for task and event management tools in the calendar then worth looking at Smart Pad and Pocket Informant, both work really nicely from my experience although I favour Smart Pad as I prefer the way it works and I like the UI as well. I looked at several apps for this and, in the end, chose Pocket Informant HD. I read that Pocket Informant was buggy but, in my (admittedly) limited experience, Iâ€™ve found no problems at all. It has a very nice user interface that's almost infinitely configurable - a complaint that many Forum members make about the iPadâ€™s native â€˜Calendarâ€™ app. So you can choose how tasks, events, projects, appointments are colour coded and there is a wide choice of notifications and alarms - so, for example, you can have different alarm sounds for different categories of notifications. Pocket Informant â€˜sits on topâ€™ of the iPad's native â€˜Calendarâ€™ app and (optionally) imports all entries that it finds there. They can be colour coded so they can be distinguished from entries made in Pocket Informant itself. This is important because many other iPad apps use the native â€˜Calendarâ€™ app as the default place to put events, invitations etc. So, for example, if you are invited to a meeting by email and you receive that invitation in the iPadâ€™s native â€˜Mailâ€™ app, that app can automatically (and quite cleverly) insert that invitation into the default calendar app. Without that integration between the native app and Pocket Informant, you'd have to enter those invitations all over again. Pocket Informant has lots of â€˜hiddenâ€™ features too. One of the reviewers remarked that part of the â€˜funâ€™ of using Pocket Informant was discovering them!! The display is infinitely configurable - day, week, month, year at a time. Tasks, events, overdue tasks, projects, projects in progress etc etc all can be optionally displayed on the main calendar. Projects and tasks can have infinitely nested sub-tasks and projects - these can cleverly be integrated with GPS - so, say you needed to purchase some goods from the hardware store. Put that in a To-Do list and link it to the location of the hardware store using the iPadâ€™s native â€˜Mapsâ€™ app. Next time youâ€™re driving past the hardware store, up pops the notification (â€˜Remember to purchase some 2â€x4â€ timberâ€™). Repeating events are very flexible too, with the â€˜customâ€™ mode being infinitely (I keep using that word!) configurable. So, meetings that occur on the last Thursday and first Monday of every other month - no problem. It can sync with external calendars - Google for example - and back-up is cool, it creates a backup file that you can email to yourself for safe keeping. If you lose your iPad or all your data is corrupted, that backup can be imported back into Pocket Informant with a single click. If you surf to the developerâ€™s web-site, you can download for free a very comprehensive User Manual that will show you in detail what Pocket Informant can do. The developers are constantly updating the program - always a good sign in my view. As I said at the beginning, perhaps I'm not a particularly demanding user, but Iâ€™ve had no stability problems at all. I should add the usual disclaimer that I have no contact or other relationship with the developers of Pocket Informant other than being a very satisfied customer. I am still exploring the few app options available. Unfortunately they have mixed reviews which is worrying. I will look at all of your suggestions as soon as I get a chance. I have been spoiled using Now-Up-To-Date (NUTD) for more years than I can remember. Now that they have folded I am in search of a new app that can perform as well as NUTD has. Eventually there will be a system update that force me to make the change. I hope to be on top of it so I will not have to make the change overnight in a panic. Unfortunately iCal does not come close. I have experimented with it running in parallel with NUTD for a few weeks. It is OK at syncing across all of the devices but it just does not handle the information in the same way. Maybe I have not given iCal enough of a chance and should try it some more. Perhaps my problem with it is "Operator Error". I need to be able to share the calendar with my office iMac, iPad, iPhone, Macbook Air, and iMac at home. I would really like it to be seamless and effortless with no worries that something is going to crash and throw all my calendar entries out of whack. It would be perfect if it could import all of the info from the NUTD Calendar file but I am resigned to enter all of the recurring items again. Pocket informant HD if you need organization to run any type of schedule and business oriented task. I've heard Daylite is good calendar for multiuser businesses, like law firms. They support iphone, ipad, and Macs. The license is expensive. Has anyone tried this program? I'm looking hard at it, but would like to hear from other businesses, as rhe investment is substantial.